What can I say, things got a little out of hand. I’d had no intention of getting caught up in anything serious that night, but you know how it goes. Something catches your eye, sparks your interest. You toy with new possibilities. Flirt a bit, even. Nothing wrong with that. But I lost my head this time, and I’m woman enough to admit it. 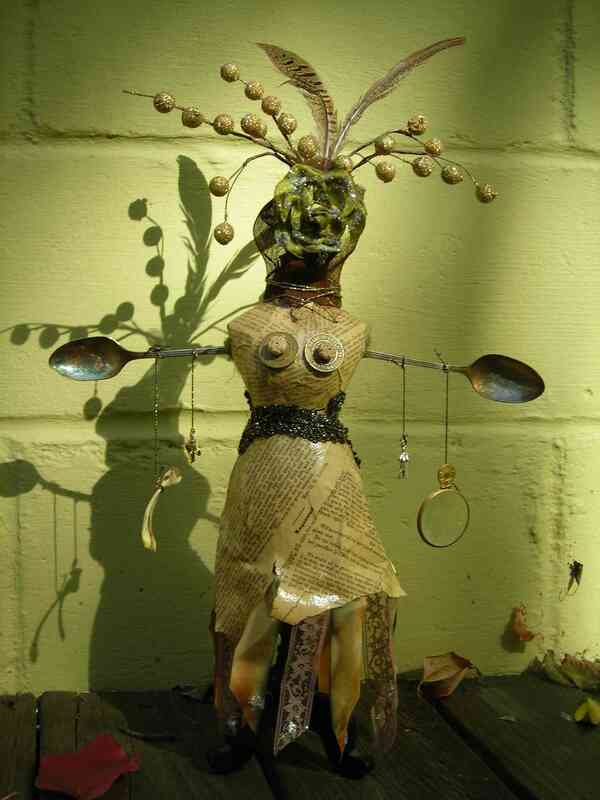 I was up in my studio with a glass of sauvignon blanc, poking around the old muffin tins, bowls and jars overflowing with stuff. Wasn’t looking for trouble, but trouble found me. Amidst the buttons, bottlecaps, partnerless earrings, faded dominos, doll parts, china shards—the smallish bits and oddities that accumulate thanks to any mixed-media artist’s magpie tendencies—my eye came to rest on some vintage board of education cafeteria tokens I’d forgotten I had. Was it the wine talking, or were they really as seductively quirky as I told myself they were? I guess it doesn’t matter now, I’m just telling you what happened. One thing led to another, and a few hours later, those cafeteria tokens had taken me down the path of no return. A small decorative dressmaker’s dummy became the body of my evening’s muse, and I found myself fashioning her a frock out of some pages of an early 1900s issue of “Woman’s Home Journal.” The page that really fanned the flames of my artistic lust was titled “Recipes From Our Readers conducted by Winifred Trafford.” Seriously, now, can you blame me? I daresay you would have reacted the same way. 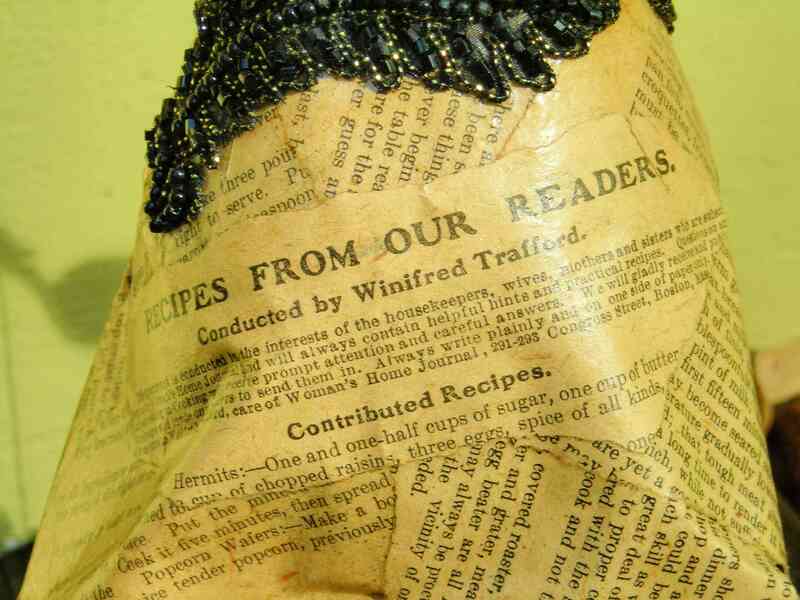 The recipes painstakingly “conducted” by Winifred for her readers became this fetching creature’s dress, with the article’s title enhancing her backside. Then things got really crazy. 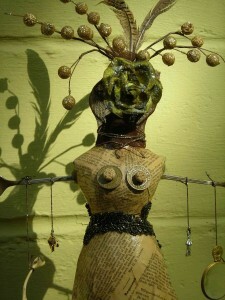 I’m not going to get into too much detail here, but let’s just say there was a glue gun involved and feathers flying. Two spoons got in on the act at one point—and the unusually long handles on those babies were obviously made for stirring up long, tall drinks of water (or iced tea), let me tell you. Now they were going to be arms, I decided, and so I set about attaching them to the half-dressed body in front of me. Wouldn’t you know, I was in the middle of this pretty intense spooning scene when I heard footsteps on the stairs. Damn! Caught red-handed. Boyfriend blinked sleepily at me. Boyfriend took it all in, his gaze shifting from the shredded paper to the tangled glue gun cord to my flushed countenance. He nodded and scratched his nose. “Righteeo then,” he said. “Have fun. See you in the morning.” And he shuffled back down the stairs, trusting, I’m sure, that our relationship was strong enough to withstand this all-nighter episode of mine. I jumped back into the fray, by this time a woman possessed, and just before dawn, the object of my affections and ministrations stood complete before me: Lunch Lady Winifred. Those cafeteria tokens that sparked this whole thing? They became Lunch Lady Winifred’s token breasts, which were set off by a couple of provocative rosebud buttons. Once she started flouncing around in her vintage lace sash and excessive hat, I realized this was no run-of-the-mill gal. I rarely speak of that night, but don’t think I’ve forgotten her. While she was gone within a week or two, every once in a while I run into the delightful woman here in Columbia, Missouri, who purchased her. She generously tells me what Winifred’s up to these days—apparently she’s jumped onto the secular goddess bandwagon, holds court in their kitchen, and has attracted even more danglies on her spoon arms than she left me with. Sounds like a good life, and I’m happy for her. Live lusciously, all you crazy lovers out there. And if that means spooning all night, then so be it. You won’t regret it. Obviously, Winifred was destined to live a luscious life in a warm and funky kitchen! Successful creation and adoption! It is simple to see that you are serious about your writing. Look forward to all your future posts as well.Thanks!